Never again. This was the worse money I have ever spent. It also had a recall that I never received the part ( We were supposed to put on ourselves). This washer would go off balance and refill and spin and refill again. I had a scrap metal company come pick it up. I use this washer four times a week if not more. I think it is a pretty good washer. After the recall and the fix, it has been working just like the first day I bought it. The machine is actually quiet and I know it has finished washing when I hear the music that plays. I don't know how to turn that off and I don't plan on turning it off. I like that it measures the weight and it takes the time to wash accordingly. The capacity of this machine is surprisingly big. It washes well, but there are certain stains that I have to try before washing, otherwise, the clothes just come out with the same stain. Overall it is working just great. The price was just right. For the most part its great! For the most part, I absolutely love my washing machine. However, sometimes it will have glitches. It will randomly stop and have an error code. It also had a recall, so if you are washing bedding you better make sure to put it on the right cycle. Its not a problem for us, but I do worry when I am in a hurry or when someone else washed clothes. 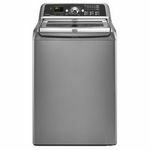 Other than those two issues this is a great washing machine. I have a very large family and the laundry piles up sky high. 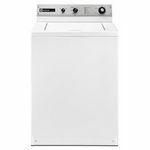 With the large load size however it makes it very manageable and our clothes always come out clean as can be. Washes great AND it looks great! When we moved into our new home, I already knew which washer I wanted. I had seen this washer before and I absolutely fell in love with the design. It was stylish and could handle a lot of clothes. We bought it and when we got it home I knew I made the right decision. 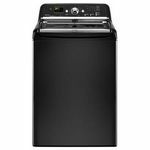 The capacity is amazing and helps me finish the laundry quickly. I simply separate by wash needs and start. I select the appropriate setting and add the detergent, press start and it does all the hard work. I love the pre-soak option for those set in stains, or even my towels. There's a cute chime that lets you know when it's done and it won't scare you with a loud horn. I love how versatile it is and how much you can customize each cycle. 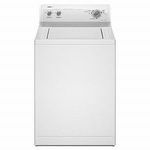 Energy Efficiency Based on the weight of the load, the washer decides the amount of water to use, as well as giving the option for water temperature and spin speed. Cleaning Time It takes about 45 min to an hour per load, but since you're putting in more clothes per load, it definitely makes it worth it. Performance Clothes come out clean, and using the settings helps clean any special garments or fabrics. Ease of Use It's pretty easy to use, just use the dial to select the wash type, and you can adjust the temperature, spin and soil level if needed. Design The design is beautiful! The drum is a bit deep for me (5'4"), but it's worth it to be able to wash more per cycle Durability I've only had it for 1 year, but so far no problems. Bottom Line : I would 100% recommend this to friends and family. I love this washer. Really works well. Lots of settings for all my different types of clothes. Love being able to wash my delicates and my bedding. It is gentle enough for my delicates and permanent press yet I can still wash my bedding and heavy duty items. Washer is deep so I have a little problem getting items the bottom. This washer has a very large deep drum. I am a short person 5'1 3/4'' (the 3/4'' counts! lol) Any way when I do regular laundry, not blankets, I have to get an umbrella or something to grab the clothes at the bottom. That being said, it is a great machine. It handles HE soaps well. The cycles can be long if you add too much soap. I didn't add that as a "con" for the ratings because thats more user error than machine flaw. There are a good range of cycles. I tend to wash clothes on delicate cycles for longer because it's efficient and is nicer to my clothes. 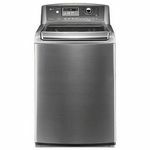 I do love the big drum because no matter what size bed I have I always get a king size comforter and this washer can handle it and the spin cycle is effective enough (in my experience) to get the king size comforter dry enough for the dryer so that it doesn't take forever. I also have a lot of black clothing. The gentle cycle, even with bargain detergent has been kind to my darks. There is nothing better than the smell of freshly cleaned laundry. I'm obsessed with it. I use my washer frequently and never had any trouble with it. The lid is a soft clothes. My clothes always come out super clean. The cycles are a bit long, but i'm find with that as long as my clothes are nice a clean. There are many different setting for the heat of the water and the cycle of spinning so that I know my clothes will last with several washes. 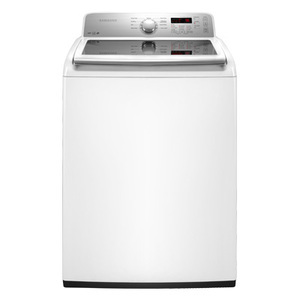 Overall, it's a great washer.